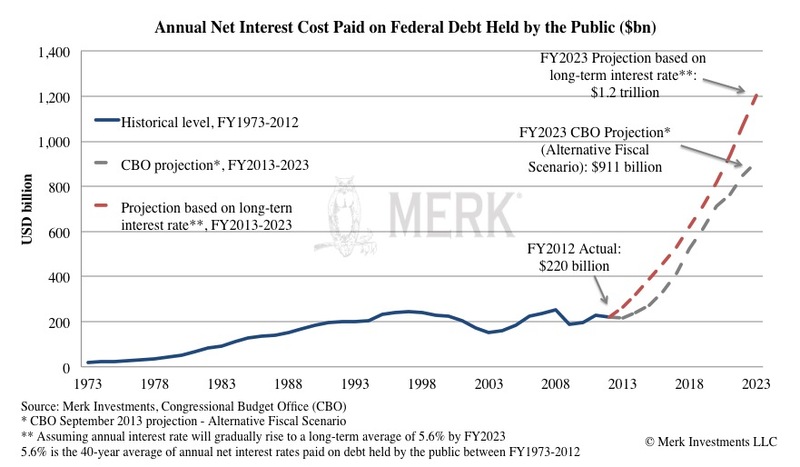 Merk Insights - Fishing for Gold? If interest rates are supposed to be on the rise, why has the price of gold gone up so much this year? Is it merely because it is bouncing back after a sharp decline in 2013? We have a closer look at the link between gold and interest rates to gauge how investors may want to approach the bait provided by the Fed. A gold bar does not pay interest. Some conclude that it must be more lucrative to hold the greenback. Except that a hundred-dollar bill under your mattress also pays no interest. To earn interest on the hundred-dollars, you have to deposit it in a bank account. That is, you are lending $100 to the bank and expect to be compensated. To earn interest, you need to accept counterparty risk, even if such risk is substantially reduced for FDIC insured deposits. Similarly, if you wanted to, you could lease your gold to potentially earn interest, however, typically individuals don’t lease their gold as they specifically own gold to avoid taking on counterparty risk, but central banks and other institutional players are active participants in the Gold Forward market. When the Federal Reserve moves interest rates up or down, gold doesn’t change. It’s one of the reasons why investors are well served measuring their gold holdings in ounces rather than in dollar value. What may change at any point is how many dollars the market is willing to pay for an ounce of gold, and that is in part influenced by other opportunities available to investors, including interest bearing savings accounts. A key reason why investing in gold is a point of contention is because an investor buying gold signals that he or she would rather own something paying nothing than put that money at risk, for example, by putting it in interest bearing accounts, coupon paying bonds, or dividend paying stocks. It’s silly, of course, to discredit gold because of this, as embracing investments with varying risk profiles, including cash, has long been a lauded practice to achieve a diversified portfolio. Investors holding cash have lost over 95% of their purchasing power since 1913. 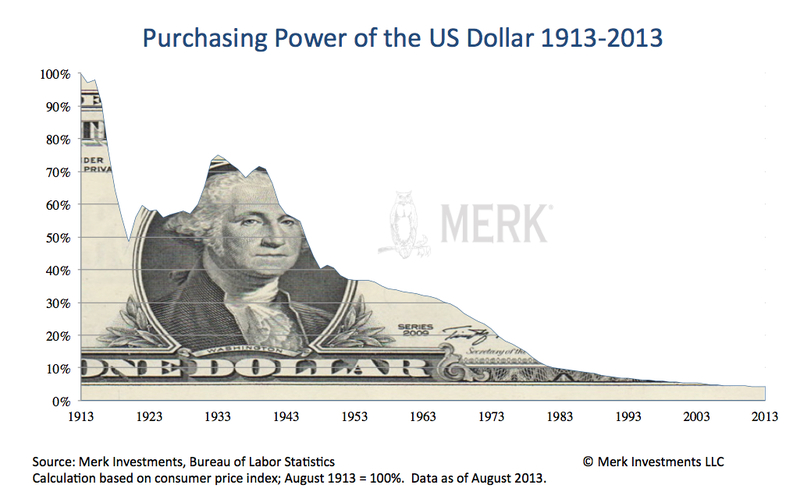 To derive this number, we debase the dollar’s purchasing power annually by the Consumer Price Index (CPI). It’s this gradual debasement that is supposed to encourage us to take risks, to preserve our purchasing power. Think of being put into a mouse wheel: even as you run fast, you are not advancing. In 1913, the price of an ounce of gold was $18.92. As of February 28, 2014, the price of gold had risen to $1,326.50; this corresponds to an annualized rise in the price of gold of 4.33%. Clearly this rise did not happen in a straight line, but for an investment that doesn’t pay any interest, it doesn’t appear to be such a bad competitor to cash. 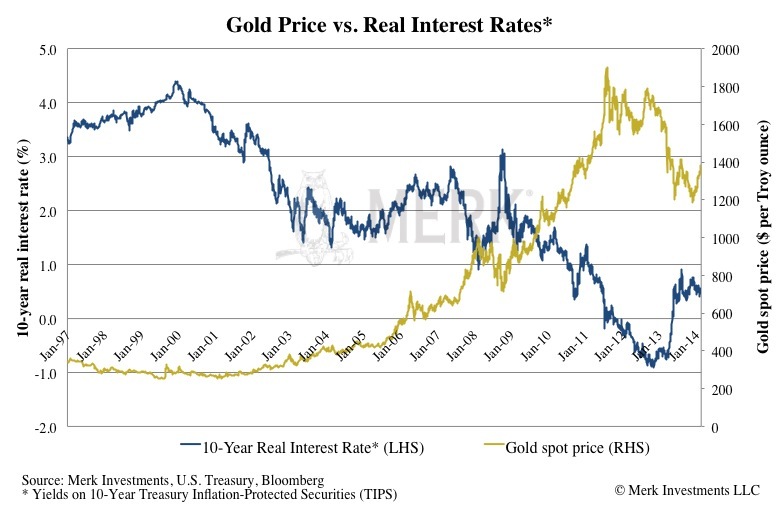 With regard to the question why the price of gold appears to have done just fine when real rates were low, but positive, one should wonder whether the CPI under-estimates inflation (and therefore shows a distorted picture of what real interest rates really are). We won’t dive into the shortcomings of CPI in too much detail here, but have pointed out many times over the years that if investors believe they get properly compensated for inflation by buying TIPS, i.e. Treasuries adjusted by the CPI, they need to look no further if all they want to do is hedge for inflation. Rather than criticizing all the changes that have gone into the CPI calculation over the years, we take a different approach here. Let’s consider socio-economic trends to corroborate the view that inflation is much higher (and with real interest rates much lower) than reflected in the official statistics. When real wages don’t rise for over a decade, people get squeezed due to a higher cost of living, we think they are increasingly dissatisfied. We believe that in such an environment, populism is on the rise as people and policy makers are looking for someone to blame for their own plight. The rise of the Occupy Wall Street movement, as well as that of the Tea Party, in our assessment, are a strong indication that inflation, as experienced by many, is higher than reported. The government statistics may be technically accurate, yet utterly missing how people feel. It’s not a problem that’s unique to the U.S. while Americans may be increasingly electing politicians at opposite ends of the political spectrum, and that may in turn make it ever more difficult to come to a grand bargain on entitlement reform (which in our assessment is urgently necessary to make our deficits sustainable), the rest of the world has even bigger challenges. In the Middle East, where food and energy are bigger portions of their citizens’ expenses, revolutions are started. In Japan, the Prime Minister is deploying populist policies to fix the country’s woes. And in Ukraine, a country that has major challenges ahead no matter who is running the country, an armed conflict with Russia is openly discussed. In brief, decreased political stability throughout the world suggests to us inflation is higher than reflected in government statistics. We conclude it is rather unlikely that we will be facing truly positive real interest rates for an extended period, as we (consumers and government alike) simply cannot afford them. 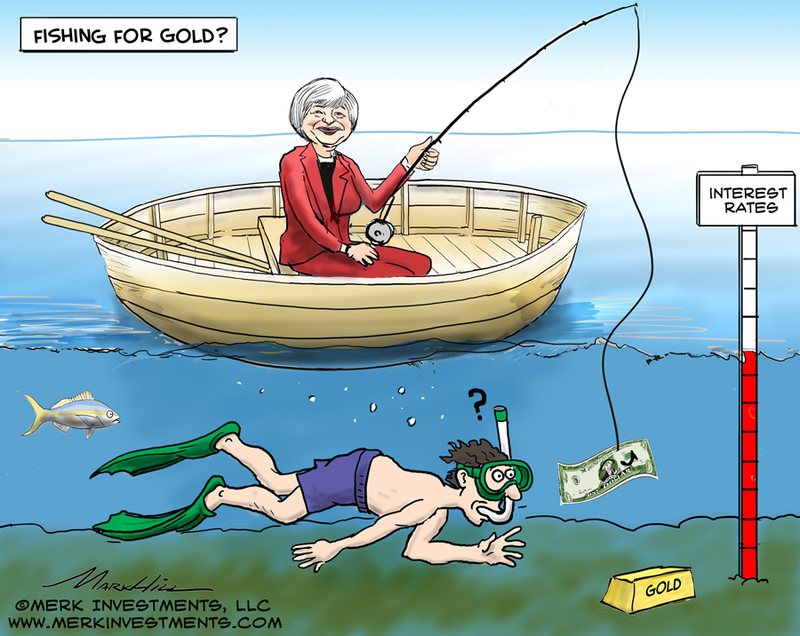 Of course the Fed is said to be independent from Congress and might prove us wrong, but given the focus of Fed Chair Janet Yellen on employment rather than inflation, we don’t see the price of gold threatened by positive real interest rates anytime soon. The recent bounce back in the price of gold appears to support our view. Said differently, while we don’t know what the price of gold will be tomorrow, we have little reason to think that the long-term track record of gold as a portfolio diversifier will be broken, even if there are quite likely going to be setbacks along the way. Our analysis suggests that the Fed will have a hard time talking tough, let alone acting tough. To expand on the discussion, as well as for insights as to how large a portion of one’s portfolio to allocate to gold, please register to be notified when we hold a webinar. Also don’t miss another Merk Insight by signing up for our newsletter.